Digitize objects with incredible detail. 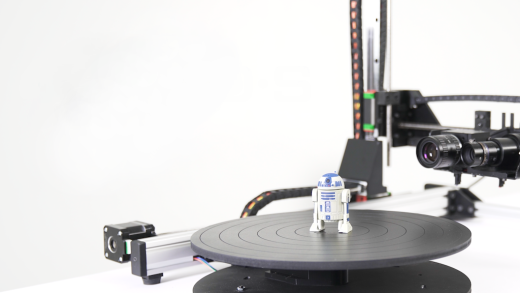 The D3D-s is a Desktop 3D Scanner that implements a new concept in 3D scanning. We've combined the best quality of projection, laser, and other expensive handheld scanners to create an automatic, unbelievably accurate, and, most importantly, easy-to-use tool. If you're looking for an affordable scanner that can produce extremely high-resolution results, this is the only solution for you. You'll face challenges when scanning with projection or laser technology. A cup or apple can be scanned from a single position, but more complex objects will require you to repeatedly reposition the model and be fully engaged in the scanning process. We've solved this problem. 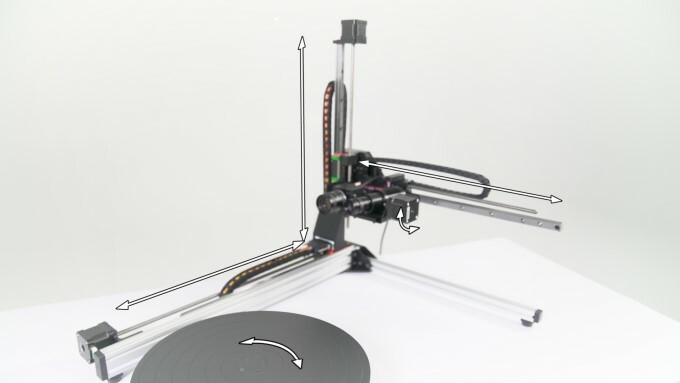 The D3D-s was designed to not require repositioning, so all you have to do is place the object on the table and start scanning. Thanks to its 5 degrees of freedom, the scanner can access any part of the model. The special algorithm built into the D3D-s keeps track of the sections that have not been scanned and scans them separately. In 3D scanning, accuracy that allows details to be discerned is paramount. For example, if a stationary scanner has a scan area that is 200x200x200 mm and a 1.3 MP camera, then the width resolution will be 0.156 mm (200 mm/1280 pixels), and the height resolution will be 0.195 mm (200 mm/1024 pixels). You're unlikely to get an accurate model with parameters like that. We've solved this problem too! 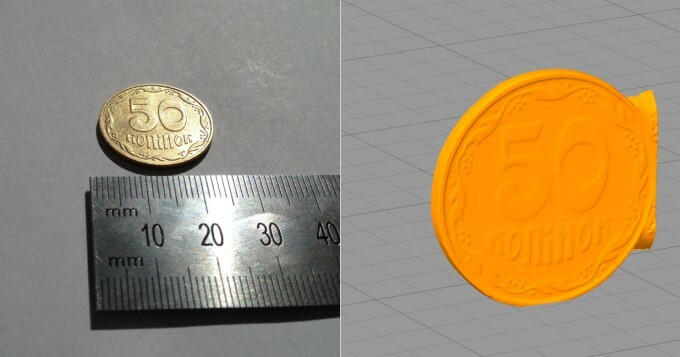 The depth accuracy of the D3D-s reaches 0.050 mm. Its vertical accuracy is 0.010 mm, and the horizontal accuracy is up to 0.005 mm. These specifications are significantly superior to all other existing scanners! This is possible because of the 5 MP camera and high-quality lens. By the way, the lens is very important if you value quality. Our 40mm lens conveys more light information than the smaller lenses used by web cameras. Such lenses are used to inspect products in machine vision applications at factories. The camera's high resolution is also important for creating high-quality textures. Thus, the D3D-s is the world's most accurate desktop scanner. 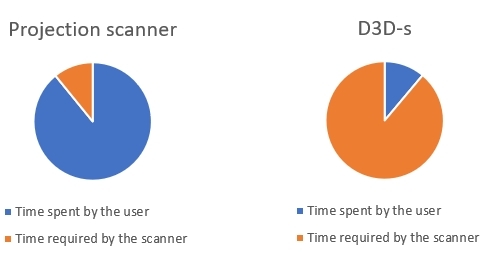 And because all of the scanner's parts are controlled by a machine and computer, the accuracy of the D3D-s rivals even that of extremely expensive handheld scanners. 1) This information is not indicated in official documentation. We calculated it, and it may be incorrect. We did not include toy scanners (EinScan-SE, SCANIFY, MakerBot Digitizer, Matter and Form, 3D Systems Sense) in the comparison, because doing so would be frivolous and misleading. Our scanner is one of the slowest in the world, but it will make you one of the fastest people! It does your work for you. You simply put the model on the table and that's it. You can work on something else while you leave the D3D-s to handle all the hard work. No other scanner offers such luxury! Scanning with amazing accuracy, the D3D-s processes a huge amount of data and isn't as fast as other less refined scanners. That said, it is more accurate and thorough than handheld scanning. Let the scanner scan! We restrict exports to certain destinations: Crimea - Region of Ukraine, Russia, Venezuela, People's Republic of China, Iraq, North Korea, Balkans, Belarus, Central African Republic, Congo, Iraq, Lebanon, Liberia, Libya, Somalia, Sudan, Syria, Yemen, and Zimbabwe, Cuba, Iran, Cyprus, Vietnam, Sri Lanka. 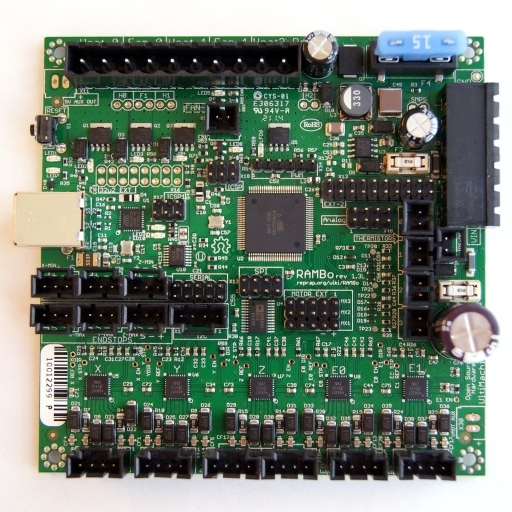 The scanner's main control element is a RAMBO 1.3 board. It is widely used in 3D printing, which means hundreds of thousands of users have tested its reliability. Additionally, the drivers for this board are already included in Windows 10. We use high-quality materials, 3M wires, and Molex gold-plated connectors. All this guarantees that the scanner will serve you well for years without any problems with the electronics. We developed software specifically for the D3D-s with lots of unique features. For example, in automatic scanning mode, the program detects previously unprocessed areas and directs the scanner to scan them. This ensures that you will get a complete model, without gaps or missing parts. Since everything happens automatically, you don't need to worry about repositioning the model and guessing what additional areas need to be scanned. The software is currently available for Windows 7/8/10, but we've laid the groundwork for porting it to MacOS. The scanning process will give you a set of *.xyz files, which contain vertices and vectors. High-quality images will be saved to *.png files, which may be used to automatically create textures and .mlp project files for opening in MeshLab. MeshLab is an application developed by talented Italian programmers. It is a free open source program. We made it so our program produces output that can be automatically processed by MeshLab, and you get ready-made *.stl files or models with applied textures. But you can also open the project file and adjust the settings. MeshLab is a registered trademark and is not part of our product. 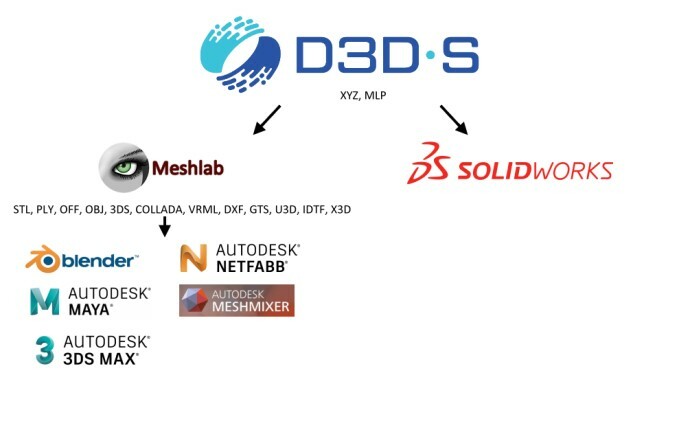 The XYZ file format is the most common scanner output, so you can use SolidWorks to convert point clouds into CAD models or use them in any other program. 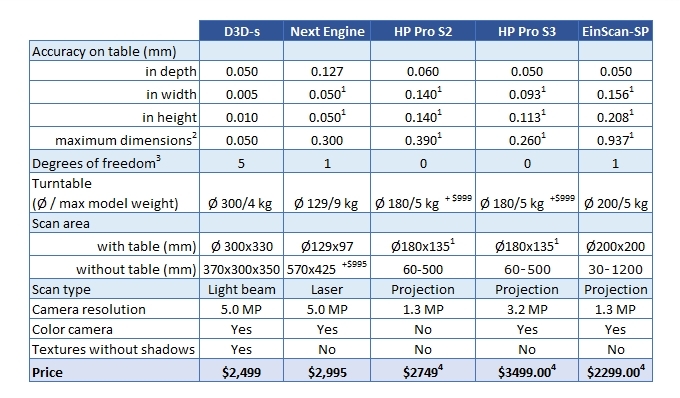 How did we make the D3D-s affordable? The scanner is made of parts that are used in 3D printers and can be purchased one piece at a time. Only a few parts, such as the projector, mount, etc., are manufactured to order in small batches. Thus, we don't have to make a huge batch of scanners. This significantly reduces our costs and investments. We, Leonid and Denys Nazarenko, father and son, created a small company to offer 3D-printing services. We used various technologies, but STL/DLP printing impressed us the most. We like the accuracy and exactness - when the model looks like real life, without visible layers from the printing process. Denys wanted to create a model of a Manjushri statue, but there are no scanners capable of capturing the model's fine details. Or if such scanners do exist, then they cost at least 17,000 euros and are simply beyond the reach of a small company. So we decided to create our own scanner. Developing the scanner was more complicated than we planned, but we were obsessed with our desire to create an outstanding product. We have modified and refined the design many times, taking into account every nuance. We value having a convenient, well-designed, and high-quality product. We really want you to love your D3D-s and be delighted by it everyday.